Bocage's Weaver was formally described by Jose Vicente Barbosa du Bocage, a Portuguese zoologist and politician. He was curator of the Lisbon Museum, and described several other weavers. 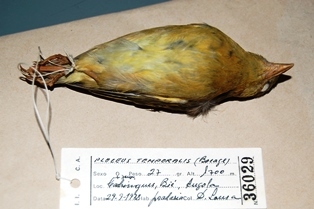 Bocage's Weaver was collected by Jose Alberto de Oliveira Anchieta, a Portuguese explorer and naturalist, who collected a large number of birds in Angola. In 1867 the Portuguese government hired Anchieta as a naturalist but probably also as a secret agent and informer in the Caconda region of Angola. Anchieta lived in Caconda, explored the area and sent many specimens and letters to his scientific correspondents in Lisbon. Anchieta discovered Bocage's Weaver near Caconda, at the south-western edge of the range of this weaver. Anchieta sent a crate of specimens to Lisbon of 126 birds collected between 1879-80, including a single male specimen of Bocage's Weaver. The Latin name of Bocage's Weaver refers to the olive mask on the face ("temples"). The first English name was simply translated to Temporal Weaver Bird, but later authors gave an English name after the describer of the species. The first illustration of the Bocage's Weaver was of the type published in Shelley (1905). 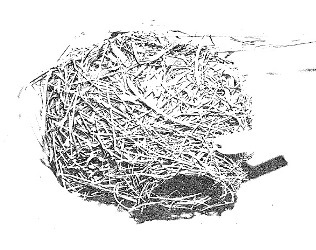 The second illustration for the species was a photo of a nest, published by Hall (1960). Hyphantornis temporalis	Bocage 1880	Jorn. Sci. Math. Phys. Nat. Lisboa, 7, p.244	Cacunda, Angola. temporalis, Latin: temporalis, of the temples of the head (tempus, the temples). Temporal Weaver Bird (Layard 1884). Angola Golden Weaver, Benguela Weaver-bird, Bocage's Golden Weaver. Identification. Bocage's Weaver is very similar to the Cape Weaver and has even been considered to be a subspecies of the latter. Bocage's Weaver breeding male has a pale eye and olive-brown face mask, and olive-brown throat patch. The female has an olive-green olive-green face patch, and brown eye; it is darker and greener than other weavers in its range. Non-breeding males resemble females but have white eyes. 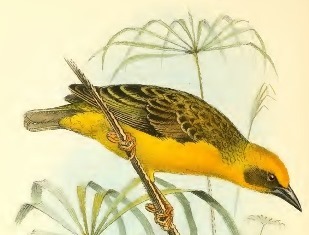 Bocage's Weaver differs from the Cape Weaver in having a short stout bill. Distribution. Bocage's Weaver is found in central and north-east Angola, southern DRCongo and north-west Zambia (see map left based on Birds of Africa). No subspecies are recognised in this little-known species. Habitat. Bocage's Weaver inhabits bushes and trees near water, usually in dambos, also in rank grassland and tall forbs alongside streams and at the edges of marshes. Food. Bocage's Weaver forages in flocks of up to 50 birds. Its diet is insects, including beetles, grasshoppers and caterpillars. Spiders have been found in the stomach of a chick. Breeding. Bocage's Weaver is probably polygynous. It is a colonial species and colonies of more than 30 nests at one site and up to 20 in one tree have been recorded. The nest is ovoid, and the entrance below may have a short entrance tunnel. The nest is loosely woven from grass stems or strips of grass blades and palm leaves. The nest has a ceiling made of leaf blades and grass heads. Grass seedheads are used as lining. The nest is suspended from a branch over water or in elephant grass next to rivers. The clutch is 2 eggs, and they are plain sky-blue, similar to Cape Weaver eggs. There is no information on incubation and nestling periods. Brood parasitism by the Diederik Cuckoo Chrysococcyx caprius has been recorded in Zambia.